I love the Uni-ball Kuru Toga, and when I saw the latest batch of Limited Editions, I jumped right on the Skeleton model. Turns out, I picked the right one, because it is already sold out! You are covered though, as I’m giving this one away to one lucky reader. Read the rules below and enter away! Posted on May 29, 2018 by Brad Dowdy and filed under Uni-Ball, Kuru Toga, Giveaways. 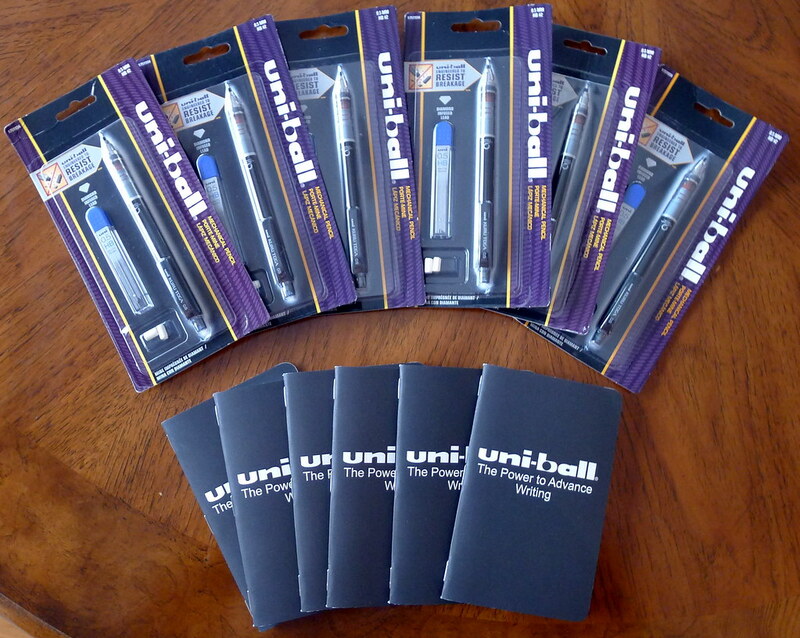 Japanese stationery manufacturers are the best in the world at product tie-ins, and no one does it better than Uni-ball. Their latest collaboration features one of the best mechanical pencils in the world - the Uni Kuru Toga - and one of the world's favorite entertainment companies in Disney. This latest Kuru Toga drop features three character pencils - Mickey, Minnie, and Donald - plus three mouse ear pattern barrels in black, blue, and pink. There are even matching spare lead holders in black, white, and pink. I went with a one of each approach, grabbing the Mickey Glove pencil, Blue Mouse Ear pencil, and Disney White lead holder. While they are all wonderfully designed - I expect no less from Uni and Disney - the character pencils are the real standout. For example, the Mickey Glove pencil features a two tone black and red barrel with white accents to match Mickeys famous look. The black section contains a single image of Mickey's white glove, and the red section a single yellow shoe. It is a simple, clean design that doesn't scream DISNEY PENCIL!!! But is classic and cool. The Minnie and Donald pencils are designed in the same fashion. The Mouse Ear patterned pencils are excellent in their own right, with small ears and polka dots in a repeating pattern up and down the barrel. The pink and blue barrels have a little extra shine as well. The lead holders are done in a similar fashion with a couple of additional colors mixed in. The one downside with this - and most - branded merchandise is that you are going to pay a premium. Two dollars more than the standard Kuru Toga (more if you can find basic black at an office supply store), and an equal amount for the lead holders. But Disney fans and stationery fans alike are happy to pay the price to see their favorite characters on one of their favorite writing instruments. I know I was excited to get my hands on these and my kids are excited as well, knowing they get them as soon as this review is done. Posted on February 5, 2016 by Brad Dowdy and filed under Uni, Kuru Toga, Mechanical Pencil, Pencil Reviews. Uni-Ball Kuru Toga + Doane Paper = Giveaway!!! 1. Leave one comment on this post anytime between now, and Thursday night at 11:59 PM Eastern Time. You are limited to one entry. Feel free to link this giveaway on your blog, or share it with anyone you feel is a true pen addict. If you have a blog, I would love a link back, but it is certainly not required for entry into the contest. 2. For this contest, I will pick six winners at random from the comments section of this post. The comments will be numbered in the order they are received, i.e. the first comment is #1, the second #2, and so on. The Random Integer Generator at random.org will be used to pick the number of the winners. 3. The contest winners will be posted on Friday, April 1st. The winners will have one week to email me at the address posted in the "About" section on the right sidebar. 4. I will ship internationally. I know there are many international readers and fans of The Pen Addict, and I will gladly ship to you at my expense. I truly love the products in this giveaway and want to thank Chad and the gang at Uni-Ball for sending me these items. You can check out their websites at the links above, as well as their Twitter feeds @doanepaper and @uniball_usa. Posted on March 29, 2011 by Brad Dowdy and filed under Doane Paper, Giveaways, Kuru Toga, Uni-Ball.